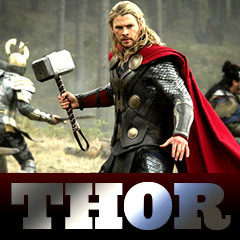 Thor - was based upon the thunder god of the same name in Norse mythology. Thor was the super-strong son of Odin. There were a number of iterations and adaptations of Thor to comic books before his most iconic version appeared in 1962. 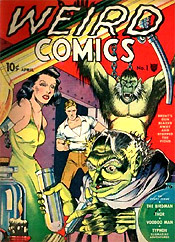 In the premiere issue of Weird Comics # 1 (April 1940), Fox Features Syndicate introduced Thor, God of Thunder. The story was written by an unknown author and drawn by Pierce Rice. 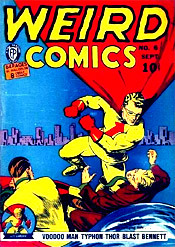 In Weird Comics # 6 (September 1940), Thor had become Dynamite Thor, the Explosion Man, created by Wright Lincoln. Dynamite Thor was the alter ego of Peter Thor, a demolitions expert who fought criminals and spies. In Fawcett Comics' premiere publication of Nickel Comics # 1 (May 1940), Thor was briefly mentioned, in name only. 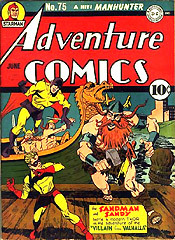 In DC Comics' Adventure Comics # 75 (June 1942), there was a villainous version of Thor (known as the "Villain from Valhalla"), depicted by Joe Simon and Jack Kirby (this was Kirby’s first rendition of the Thunder God). Thor battled against Sandman and Sandy. 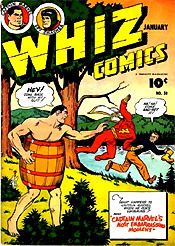 In the Fawcett Comics publication, Whiz Comics # 50 (January 1944), Thor appeared in a story titled "Loki, the Terrible," by Otto Binder. 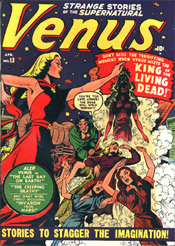 In Atlas Comics' Venus # 12-13 (February to April 1951), a different version of the mythological Thor appeared. 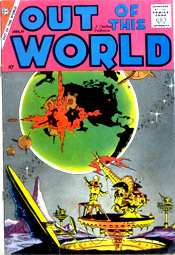 In Charlton's Out of This World # 11 (January 1959), artist Steve Ditko drew a Thor story ("The Hammer of Thor"). 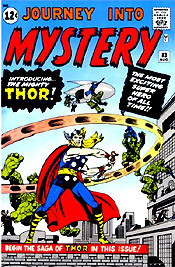 The modern-day, canonical version of Thor, the fictional superhero character of the Mighty Thor, appeared in Marvel Comics' science-fiction/fantasy anthology series Journey into Mystery # 83 (August 1962), created by scripters Stan Lee and Larry Leiber, and artist Jack Kirby. Loki renewed his ancient vendetta against his half-brother Thor, which led to the formation of the Avengers. Thor was one of the five original members of superhero team of The Avengers. 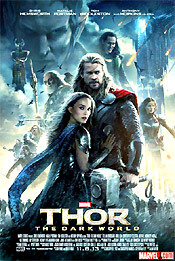 Director Kenneth Branagh's and Paramount's Thor (2011), another Marvel Comics production from Marvel Studios, starred Chris Hemsworth as the mythic title character, an Asgardian god (golden, hammer-wielding Norse god of Thunder) and crown prince. His hammer was known as Mjolnir. Thor was a founding member of the Avengers and one of the strongest, most powerful beings on Earth. It was the fourth film in the Marvel Cinematic Universe. Thor battled against his villainous adopted brother Loki Laufeyson (Tom Hiddleston) who wished to become king of Asgard. It also starred Natalie Portman as astro-physicist Jane Foster. 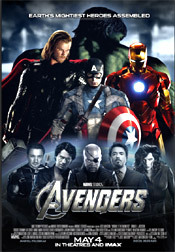 A number of super-heroes appeared in Marvel's The Avengers (2012), including the appearance of hammer-pounding Thor (Chris Hemsworth). The sequel Thor: The Dark World (2013) (aka Thor 2), was directed by Alan Taylor (from Game of Thrones). It was the eighth film in the Marvel Cinematic Universe. It again starred Chris Hemsworth as Thor, who brought his human love interest Jane Foster (Natalie Portman) to the celestial realm of Asgard. His main new foe was Malekith the Accursed (Christopher Eccleston). 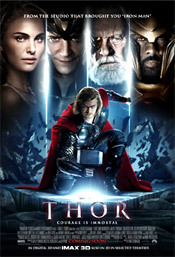 This film was the third Thor installment in the Marvel Cinematic Universe. It was considered a sequel to the previous two films in 2011 and 2013. 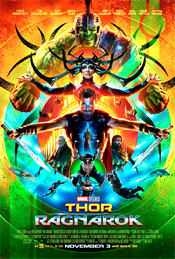 This installment was directed by Taika Waititi. It was the 17th film in the Marvel Cinematic Universe.